An increasing number of farmers in the North of Laos are moving away from traditional ways of keeping pigs to meet growing demand for pork meat. The problem they face is slow animal growth due to the poor quality of feeds. 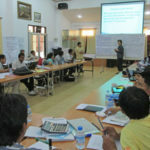 In order help farmers improve productivity, the Crawford Fund sponsored a pig nutrition and management training course. The course was facilitated by Dr Joanne Millar, Senior Lecturer from the School of Environmental Sciences at Charles Sturt University and Dr. Phonepaseuth Phengsavanh from NAFRI in Vientiane, Lao PDR. It was held in Luangphabang and attended by 19 extension officers, three livestock researchers, two extension researchers and one farmer. During the course, researchers from Livestock Research Center presented new outcomes of research on local pig nutrient requirements and nutrition, and ways to improve smallholder pig production. Participants looked at different local available feeds and separated them into energy and protein sources. They also practiced feed formulation for pigs in different growth stages in order to understand that nutrient requirements can vary from animal to animal. Extension specialists facilitated a discussion on the best methods for working with farmers, and how to evaluate production and livelihood impacts from practice change.